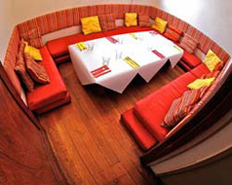 If you have a party coming up, why not enjoy your party in one of Fiesta’s functions room! They have a large function room upstairs that can host various groups or parties and, a small private siesta room with floor cushions to sit on. If you are looking for a function room in Melbourne then look no more, Fiesta is renowned for its vibrant group parties in their festively decorated function rooms. The decor is a reflection of the colourful atmosphere in the restaurant and the Mexican food Fiesta serves. 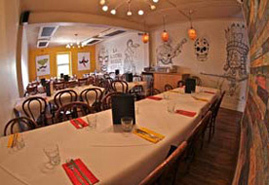 Fiesta is the number one function venue in Melbourne for birthdays, corporate events or any other reason to celebrate. Their Mexican food banquet menus are shared by everybody, so all the señors and señoritas will have a great time! Fiesta’s bright and unique Piñatas will make sure your party stays memorable. Their piñatas are paper mache figures filled with lollies. Group members take turns to hit it blindfolded; the aim is to break it open for a shower of sweets. Great fun for the whole party! Fiesta’s friendly staff look forward to helping you celebrate any occasion.